The Island of Eriskay has some of the most beautiful and evocative scenery in the Outer Hebrides or Western Isles, of Scotland. 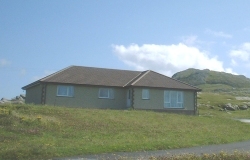 Cuan Siar is a large, modern & comfortable self catering cottage, with accommodation for eight or more people, providing an ideal base from which to immerse yourself in Eriskay's special charm and atmosphere; it's a truly idyllic location, complemented by the equally fascinating neighbouring islands of South Uist and Barra. Eriskay is an absolute Paradise for kids; it's healthy and safe with it's pristine beaches and the clear clean Atlantic, home to the seals which frequent the rocks, Ben Scrien & Ben Stac to climb, the wide open freedom, and long, long days in Summer. Besides its breathtaking location, the house itself is spacious and comfortable, consisting of kitchen/dining room, utility, hallway, playroom, lounge, bathroom and four bedrooms, one en-suite. The bedrooms are currrently configured to sleep eight in comfort, i.e. two king sized doubles, two singles and one set of single bunks. All usual appliances are there, e.g, washer, dryer, dishwasher, fridges, freezers, all linens, towels and utensils, TVs, DVD, VCR, Hi-Fi, Playstation & 20 games, portable radio/CD player, telephone, chess, cards & other board games, local interest books, maps, 6 ft pool table, plenty rods, reels & fishing tackle plus a barbecue to grill your catch on!